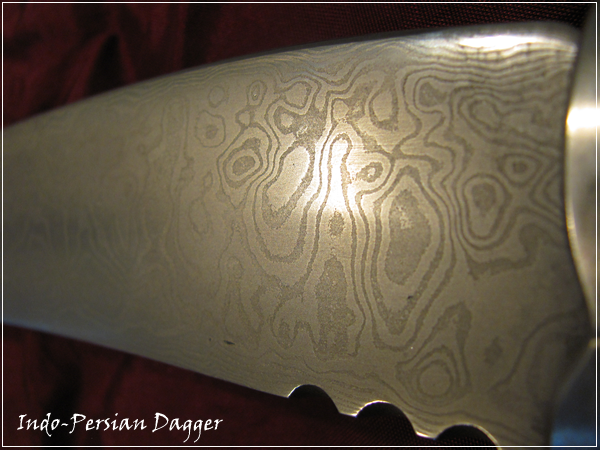 The inspiration for this dagger came from several historical indo-persian pieces. The blade is 100 layers of random or wood grain pattern. The hilt or guard is wrought iron with a amythist set in gold. The handle is Cocobolo and has hidden tang construction. The blade is 11" and the overall length is 16" making this a large dagger for it's type. The blade was forged by Kerry and ground polished and etched by matt.